Did Tabasco come up with a Sriracha sauce worthy of the legend that is Sriracha? Or is this a Sriracha sauce that is worthy of the legend that is Tabasco? 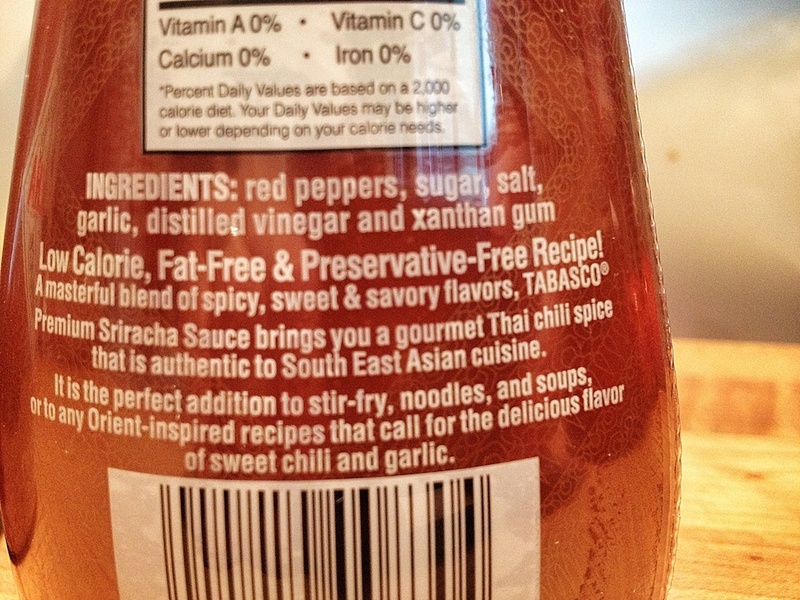 According to the label, McIlhenny Co. Tabasco Brand Premium Sriracha Thai Chili Sauce is the official name of Tabasco’s new Sriracha sauce. Just between us, we’ll call it Tabasco Sriracha Sauce for now. 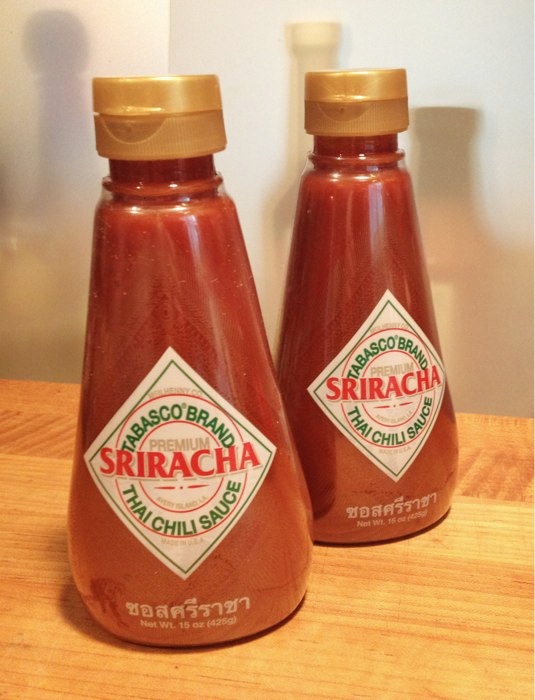 Smack dab in the middle of the Sriracha controversy that was Huy Fong Foods vs. Irwindale, California, Tabasco® quietly released its new Sriracha sauce – in a plastic squeeze bottle that looks nothing like any other Tabasco bottle. Here’s our first look at Tabasco Sriracha Sauce (and the bottle) that McIlhenny created. Ingredients: red peppers, sugar, salt, garlic, distilled vinegar and xanthan gum. Not much going on there; it’s amazing that such a simple list of ingredients can produce the flavor of sriracha. Then again, the McIlhenny family knows what they’re doing. The dark orange color of the sauce is slightly pulpy – almost “puffy”. Yea, we’ve not used that term for a hot sauce before. It clings nicely to the spoon, and the body holds up well on a plate. I think there is a nice bit of viscosity to the sauce – and Marilyn points out that it’s thinner than ketchup, but thicker than some tomato sauces. Let’s face it, everyone will compare this to Huy Fong’s Rooster sauce. So here is a side by side pic of the two sauces in some clear spoons. 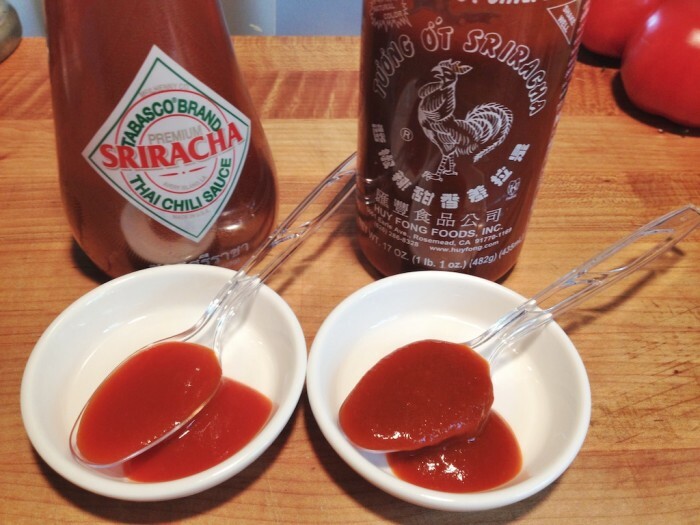 I would be very disappointed if Tabasco’s Sriracha looked and and “felt” (texture, taste) like Huy Fong’s Sriracha. In fact I would be disappointed if any other sriracha sauce was similar to Huy Fong’s. Only because, A) Huy Fong is an original, and B) There is so much room on in the marketplace for new versions and flavors of sriracha. With the explosion of Sriracha style sauces that are hitting the market in the past few years – TexasPete’s CHA!, store brands from Harris Teeter and Trader Joes, Sriracha Jerky, Rubs, BBQ Sauces (just click our Sriracha tag and you’ll see there are dozens of Sriracha products coming online), this is a very exciting time for Sriracha lovers. And we need not be beholden to just one or two! The first smell is of peppers and vinegar – not unusual for a Tabasco brand sauce. The garlic is the next big aroma, as it should be. Tasting off the spoon, I can’t shake the strong salty flavor here. Then there’s the peppers and vinegar again, followed by the garlic that really lingers. The heat comes up behind the garlic and hits you with a good sting. The sauce coats and fills the mouth with the peppers first, pungent and sweet vinegar is next, and garlic and the sweet pulp of the pepper mash finishes everything up. I want to address the initial saltiness we tasted straight up off of the spoon. The salty taste was evident and strong… but thankfully it dissipated when cooked on food. Maybe we are getting more sensitive to salt content in sauces and foods as we get older. Both Marilyn and I give this a – 2.5 out of 5 stars for middle of the road, pleasant yet prominent heat. Nothing to shatter the world, but enough heat to be relevant for a sriracha sauce. 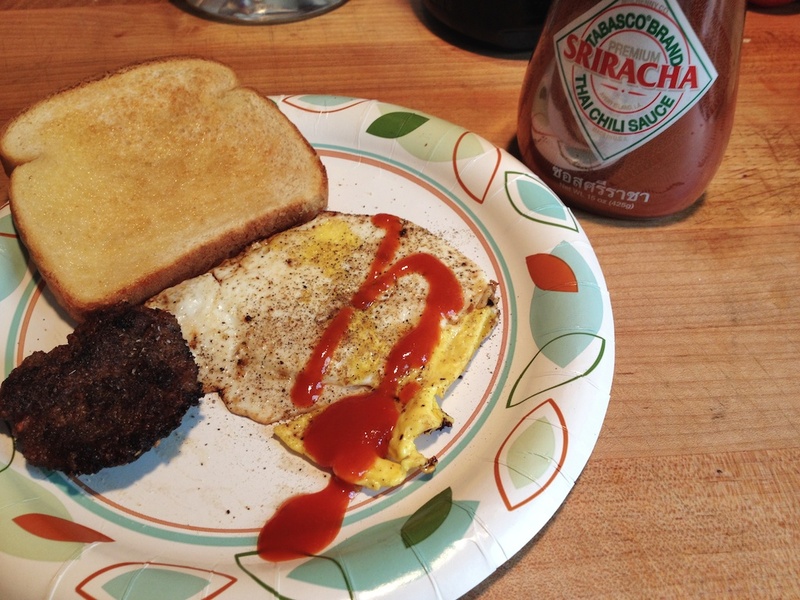 The Tabasco Sriracha worked well with my eggs… very flavorful and hot, although just a bit salty. I can’t shake that yet. 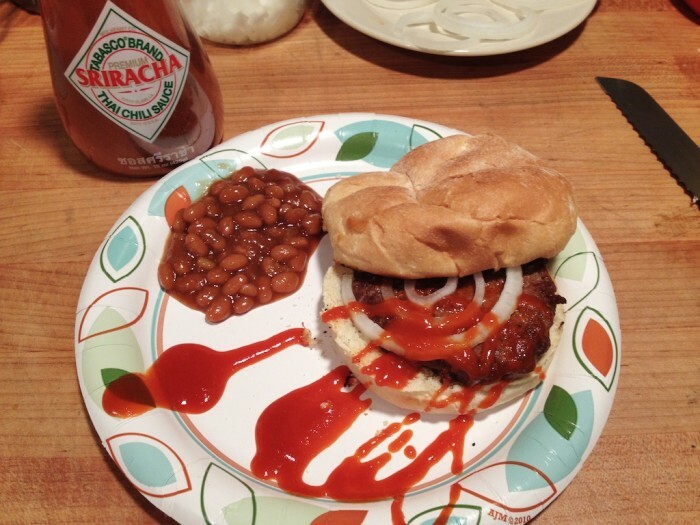 We have a Sriracha Burger recipe that we love to do on the grill, and so we slathered some of the Tabasco Sriracha sauce on a few burgers. While it worked out good, the Tabasco Sriracha was a bit milder compared to other Srirachas on the burgers. This one just didn’t have the fire left after grilling. It got very mellow and lost it’s punch. My apologies for overdoing the “artsy-fartsy” drizzle of sauce on the plate. That was partly due to the squirt top of the bottle. More on that below. Ok, while not truly cooked on wings, I did toss some Tabasco Sriracha Sauce with butter on some crispy wings from Popeye’s. 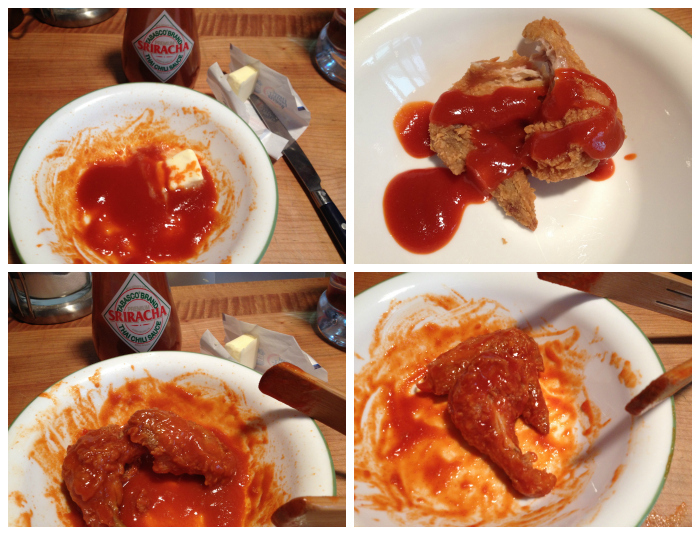 While it was a very unscientific test, Tabasco Sriracha sauce and butter made for some very tasty wings. The only thing missing was some real garlic bits, but the sauce made up for that in a small way with its garlic ingredient. We will be making some deep fried wings soon to put the Tabasco Sriracha Sauce through the paces as a wing sauce. 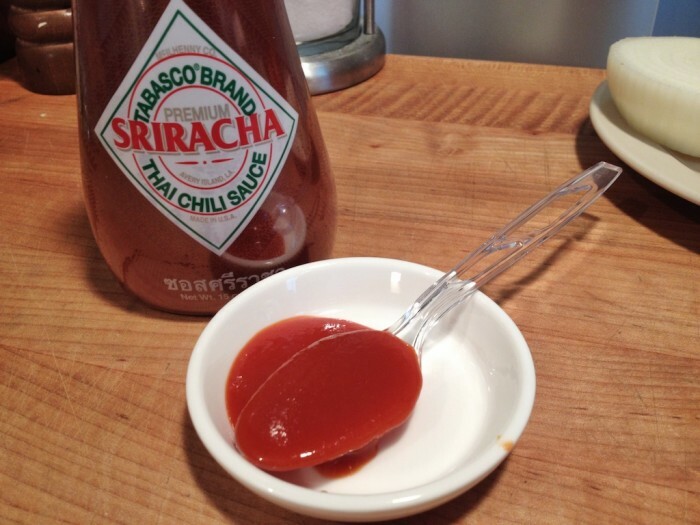 Tabasco Sriracha Sauce’s flavor is true to a Sriracha sauce taste – the garlic and sun ripened peppers really stay on course with the overall flavor profile of a Sriracha sauce. Overall rating: – Great effort from McIlhenney and Co on this sauce. For a domestic product, they nailed it. The bottle design is a huge departure from the classic glass shaker bottles of Tabasco’s other sauces. This squeeze bottle reminds us of a Dijon mustard bottle. It’s pear shaped and the label is a plastic wrapper that crinkles when squeezed. Very un-Tabasco-like. Just weird. 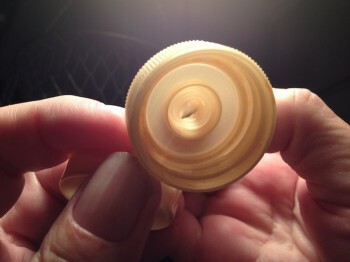 The “flip top” sports a very small opening that results in the sauce being squirted out at a very high velocity. Wow, more terms we’ve never used in a review. Just take it slow… the sauce does come out fast. For now, the only place we know of to order Tabasco® Brand Sriracha Sauce is on their Country Store website. Maybe our HotSauceDaily.com readers will email them and tell them we sent you for their newest sauce. It should be front page news! Of course, if you get a chance to try Tabasco’s Sriracha Sauce – please let us know in the Comments below. Win a Limited Edition Bottle of Tabasco in a Big Easy package! With New Orleans as the host city for the Super Bowl this February, food and drinks will be an even bigger part of the annual celebration, and McIlhenny Company is commemorating the big game and the “Big Easy” with a limited edition bottle of Tabasco Original Red! The bottle and carton will feature a purple, green and gold football-themed design, and a portion of the proceeds will go to Taste of the NFL and their efforts to end hunger in America. 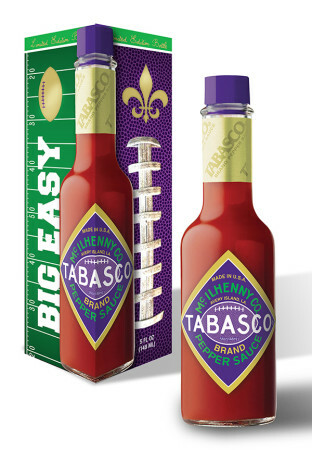 A Portion of Proceeds to Benefit Hunger Relief Through Taste of the NFL – Just in time for the big game in New Orleans, McIlhenny Company announces the release of a limited edition 5-ounce bottle of Tabasco® brand Original Red Sauce. McIlhenny Company is proud to support Taste of the NFL to help address the needs of the hungry and homeless in America. Through the sale of this limited edition bottle, a portion of the proceeds will be donated to the organization to help feed families who turn to their local food banks for assistance. The limited edition bottle is available at www.TABASCO.com at a cost of $9.50 per bottle. How to enter: Simply leave a Comment below telling us who YOU think will win SuperBowl XLVII. One entry per person. We will do a random drawing from all entries, with a winner from each team’s fans. One for the Raven’s fans, one for the 49’ers. Contest runs from 12:01 am ET 1/29/13 thru 6:30 pm ET (kickoff) 2/3/13. McIlhenny Company produces TABASCO® brand products, which are sold in more than 165 countries and territories around the world and labeled in 22 languages and dialects. The 144-year-old company makes a line of pepper sauces, including its world-famous Tabasco brand Original Red Sauce, Green Jalapeño Pepper Sauce, Chipotle Pepper Sauce, SWEET & Spicy Pepper Sauce, Habanero Sauce, Garlic Pepper Sauce and the newest addition, Buffalo Style Hot Sauce. The Taste of the NFL (TNFL) is a 501c3 that exists to raise awareness and dollars for hunger relief organizations involved in tackling hunger in America. The Minneapolis-based organization conducts national and local fundraising events throughout the year to raise money to combat hunger issues facing millions of Americans. People must also be knowledgeable about the advantages of loaning so that they can have enough money for their daily needs. Just make sure that the rules and considerations are properly discussed to avoid financial issues. By the way, as I read loanovao’s reviews it made my day for all of it are promising. To date, Taste of the NFL has raised more than $14 million for this critically important cause and is looking forward to its 2013 event on the eve of Super Bowl XLVII in New Orleans. For more information, visit www.TasteoftheNFL.com. Our winners, randomly selected using random.org are: Rachael Abel for the 49er’s and Alan Bowman for the Ravens! Congrats and thank you to everyone who entered!